We are a company based in Douglas on the Isle of Man and operate under the consortia of Hays Travel group as an independent travel agency. We are proud to introduce our Island Travel Family. 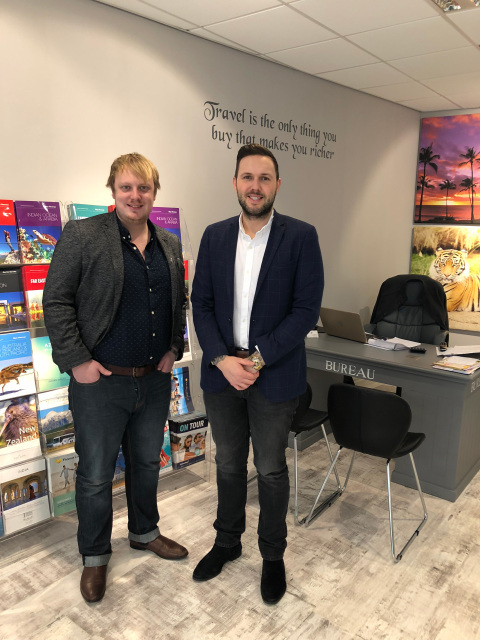 Our company directors Rikki Dunnage and Edward Cox have a combined 30 years travel experience between them and a passion for all things travel related. Both spending a good part of their working lives at Thomas Cook and decided to transfer their passion for this industry into something new. They are both well-travelled and are on hand to give you expert advice whenever you need it. Rikki's favourite holiday destination is Orlando, Edward's is Las Vegas! Paul Etherton is our Foreign Exchange Manager and has over 40 years of travel industry background. With competitive local market beating rates, our Foreign Exchange is now famed for instant stock on most currencies, unrivalled advice and the ability to work with companies as well as holiday customers. Paul's favorite holiday destination is India. Bethany Cooper is an award winning Travel Agent who won the TTG Young Travel Agent of the Year 2018. Bethany is a brilliant Holiday Expert and has a big client base already. If you are looking for friendly, knowledgeable service then please contact us today to arrangement an appointment with her. Bethany's favourite holiday destination is India. Scarlett Kneen joined us in April 2018, she is fast becoming very knowledgable and her friendly service is second to none. Scarlett's favourite holiday destination is Greece. Since opening in 2013, Island Travel have quickly become one of the most well-known and well-respected agencies on the Island. Picking up multiple awards along the way, our Travel and Foreign Exchange Experts are available to help with all your travel needs. Edward & Rikki, the Company Directors.